KFC (Kentucky Fried Chicken) is a chain of fast food restaurants specialising in chicken meals such as chicken pieces, wraps, salads and sandwiches. 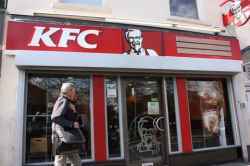 Based in East Road, Cambridge, KFC is an American restaurant. KFC is in East Road Cambridge. You can view a list of neighbouring businesses by going to the East Road page. If you would like a list of other listings throughout Cambridge, please visit the American Restaurants section of this website. Note: the pin is positioned at the postcode centre, and may not correspond with the precise location of 174 East Road.